January is a month of celebrations, with the festivals of Pongal, Shankranthi, Lohri, Bihu, among others, celebrated across India. It is a season of plenty, marked by good food, colourful kolams/rangoli, family time, traditional dances and sporting events. In keeping with this, the theme of the first workshop of 2017 was Harvest. The day started as usual. The pro-jallikattu protests in Chennai had entered the sixth day, unprecedented in the city's history both due its peaceful nature and participation of people irrespective of age, gender, caste and any other distinction. However, just as we were patting ourselves on our back, things took an ugly turn, and road blocks, arson, protests and traffic jams were reported from all corners of the city. This did not deter our members from setting out of their homes. Many were stuck in traffic and finally eight members were able to attend the workshop. 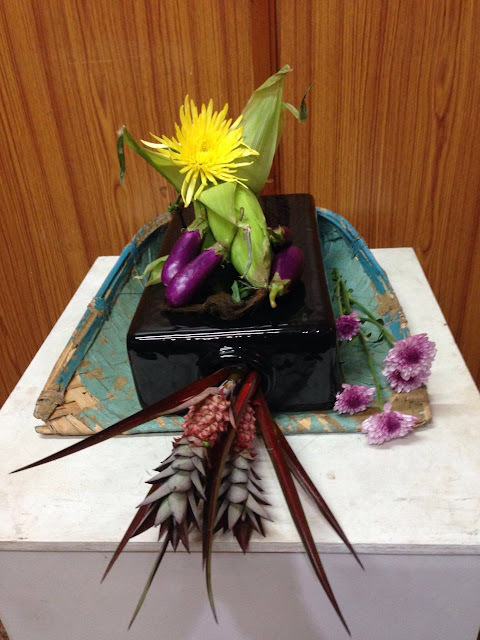 As an exception due to circumstances beyond our control, Bhuvana and Chelvi made the arrangements at home and sent in pictures. Sensei Meenakshi Sarin demonstrated three pieces on the day's theme. 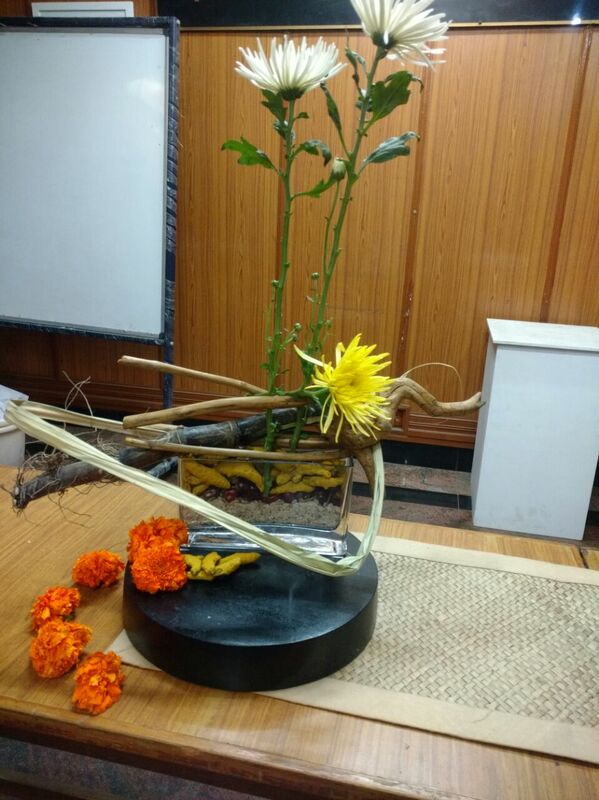 Sensei Meenakshi - Her arrangement using fresh turmeric roots denoting auspiciousness, sugarcane and yellow flowers for prosperity, set the mood for celebration. Farm animals are decorated with bright paint on their horns, and colorful garlands around their necks. Meenakshi found a unique piece of driftwood during her recent travels, and has used this, along with red and yellow flowers, to symbolise the worship of the animals that help in agriculture. The second composition by Sensei Meenu. 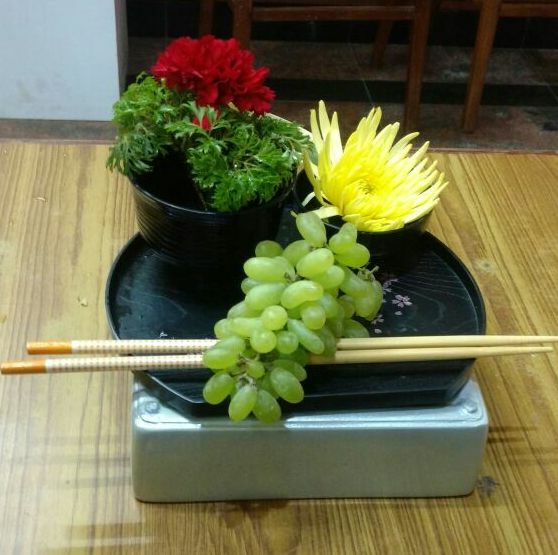 The third piece by Sensei Meenakshi conveyed the simplicity of the Japanese food plate, a work of art in minimalist style. 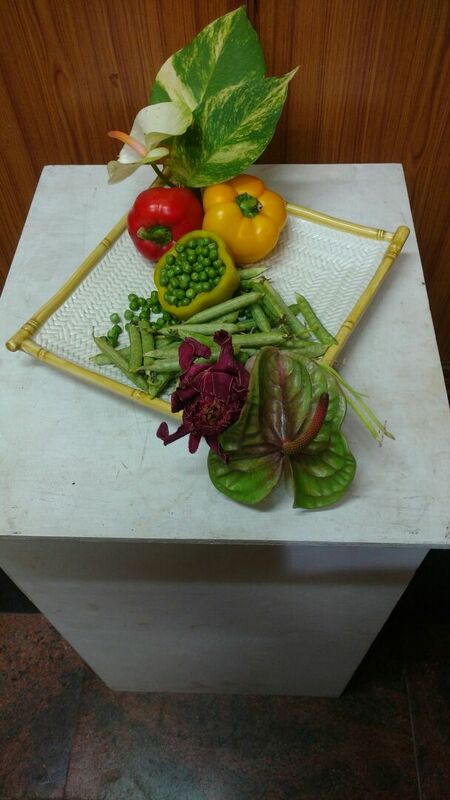 The members then went on to create morimono pieces, using fruits, vegetables and flowers. Morimono has been part of the Japanese harvest festivals and is derived from the Japanese words moru, "to heap up" and mono "thing"--and denotes heaped up things. There is, however, a method to this, and the piece should convey a meaning or story. It may be simple, minimal or denote abundance and joy. 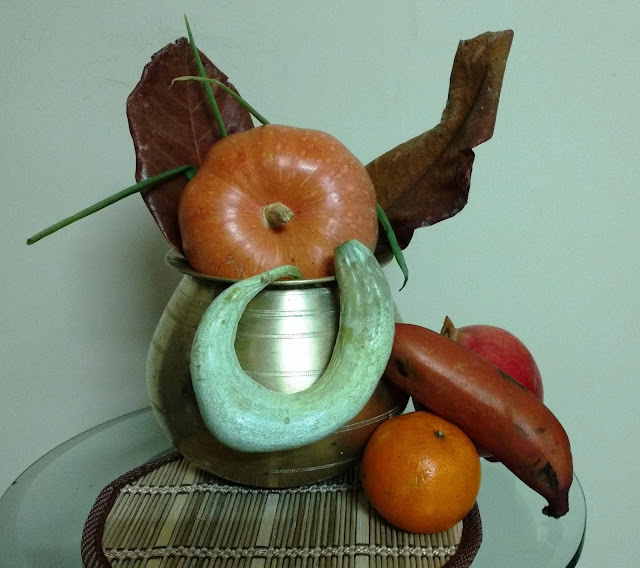 The unique aspect of each material used should be the focal point of this arrangement. 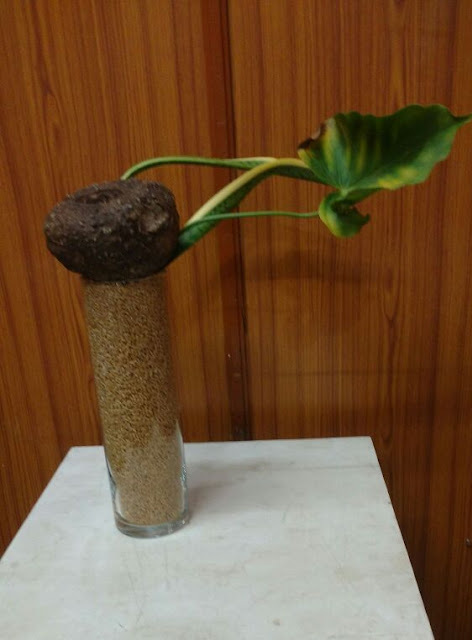 Sensei Malathi used a tall transparent nageire vase filled with wheat grains, topping it with a single yam to show harvest and beautifully curving leaves, conveying earthiness and new beginnings. 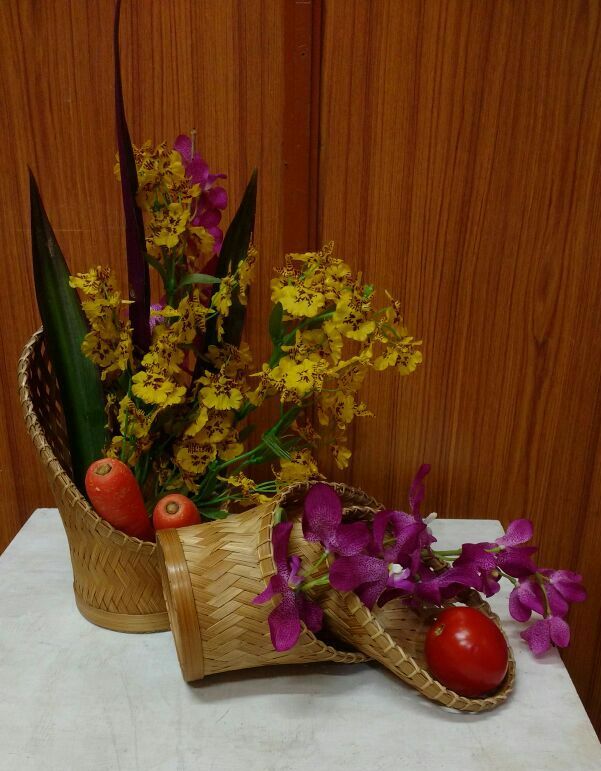 Sensei Padma used simple bamboo baskets with fresh carrots and tomatoes, heralding the harvest season. The yellow orchid --Dancing Lady-- shows bounty and used on auspicious occasions. The purple orchids brighten up the whole arrangement. 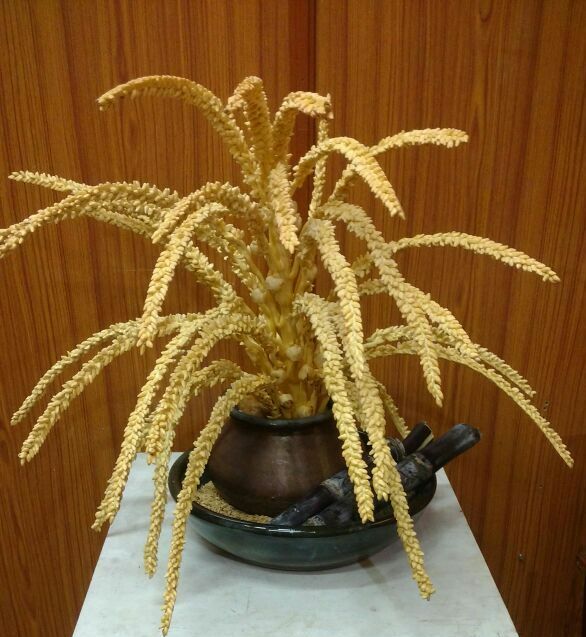 A fresh frond of coconut flowers in a copper pot, sitting on a paddy-filled ceramic suiban--these materials are an integral part of any auspicious occasion. Divya brings them all together to create a simple yet striking festive mood. 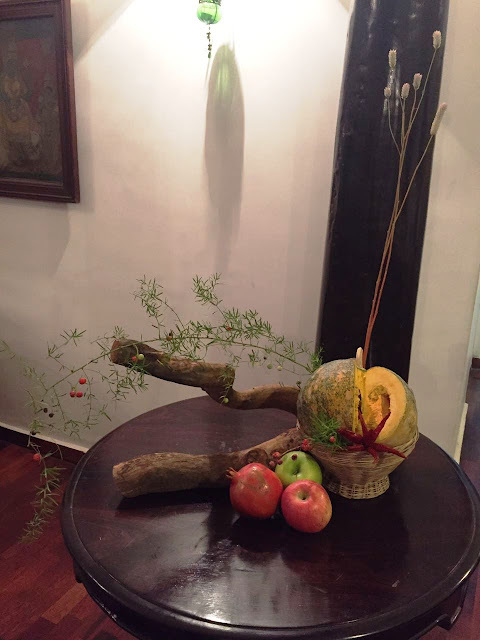 Chitra Rajan used a green pumpkin, hollowed out to create a vase, and the dark suiban showcases the bountiful vibrancy in harvest colours. Red and yellow enhance this effect. 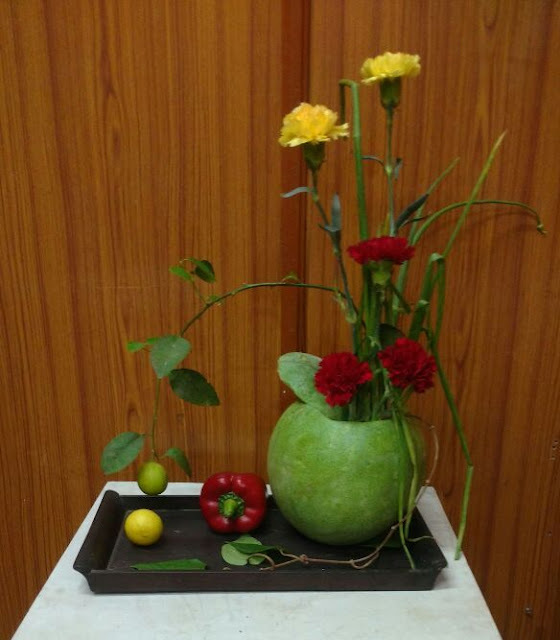 A still life painting, no less, is how the piece by Chitra Thiagarajan may be described. A white bamboo tray is a perfect base for this work that harmonises abundance, colour, aesthetics--all that morimono stands for. Sensei Prerana used a traditional "moram" as the base and painted it green to echo the harvest colours. A black ceramic vase kept flat made an interesting contrast for brinjals and corn cobs. 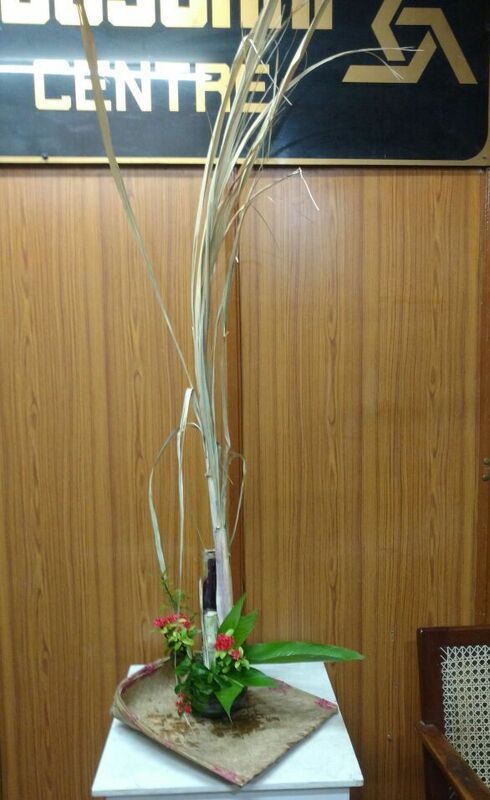 Ornamental pineapple and flowers complete the festive look. Bhuvana, having got stuck in traffic, was unable to attend the workshop, and sent in a picture of her morimono done at home. 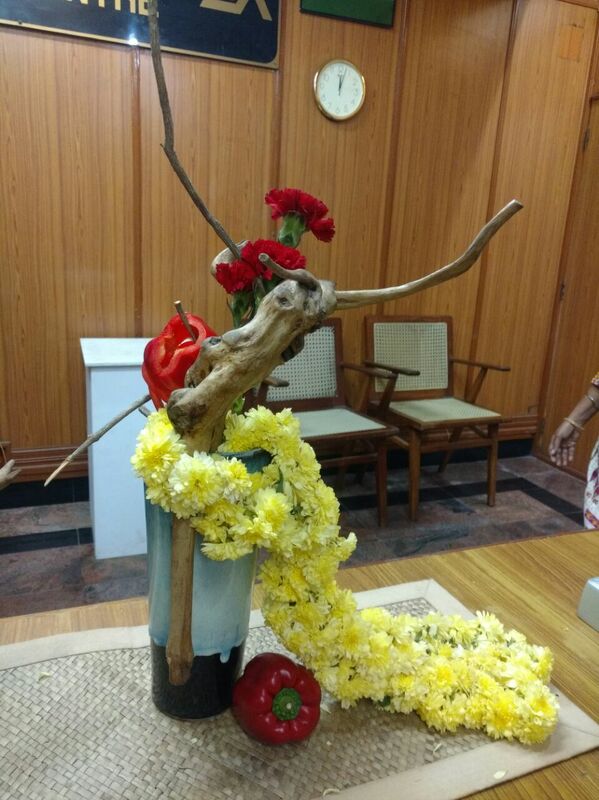 She chose a traditional brass pot used during Pongal celebrations, with gourds,fruits and dry materials to portray Ganesha--lord of plenty and prosperity. Chelvi too was in the same predicament and unfazed by the situation, came up with a lovely piece and sent in pictures. She used a small cane basket as the base for a yellow pumpkin, sliced open to double as a container. Contrasting fruits, roots and greens convey a deep connection with Mother Earth and its simplicity speaks volumes. Sugarcane, "moram" and ixora greens are Molly's choice for her Pongal themed arrangement. It was a day well spent, celebrating Nature's gift to us, and conveying this through Ikebana is a truly creative process. We are happy to share this with our readers and look forward to many more exciting workshops in the coming months.